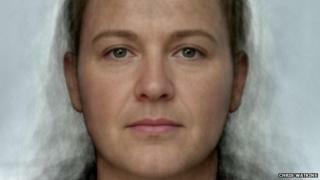 An image of the "average Dundonian" face has been created from photographs of city dwellers. Abertay University psychologist Dr Chris Watkins created the composite image from the eyes, ears, noses, lips, cheeks and chins of city residents. Dr Watkins is studying the relationship between appearance and behaviour, and how people judge others based on their physical characteristics. Images of the average man and average woman were also created. Dr Watkins turned photographer to create the image, by convincing as many current Dundee residents and people born in the city as he could to "donate their faces to science". The picture was pulled together by averaging the shape, colour and texture of features of everyone who took part. A standard template was matched to all of the key features on each face, so that each point had its own X and Y co-ordinates. The data was then used to calculate the average shape of the set of faces, and the features contained within them. Each individual face was then "warped" into the average template and morphed together to create the final face. Dr Watkins said: "Our physical appearance is a product of both inheritance and the lives we lead. "We can use these prototypes to explore whether we make any judgements about faces that belong to the given category. "For example, some researchers have constructed averages based on people's responses to personality questionnaires and used these findings to test whether people who appear a certain way - such as people who look like extroverts - also report acting in that way. "We can also use the software to exaggerate specific features in individual face images in order to explore whether or not they have an effect on how we judge the face. "Lots of work has used these techniques to make faces appear relatively masculine or feminine, in order to explore whether these facial characteristics influence how attractive, trustworthy or dominant we judge a face to be."